A dank, musty odor lingering in your home can make the whole place feel unclean and unwelcoming no matter how neat and well decorated it is. Worse yet, certain sources of musty smells can harm your health. While you’ve probably noticed regular cleaning methods and air fresheners have only a limited effect, that doesn’t mean you’re stuck with the smell. In fact, the sooner you get started, the easier it will be to completely get rid of the odor. Before you choose your angle of attack on the odor, you need to track down the source. If you don’t eliminate the source of the odor, that mustiness will return. The root cause of musty smells is mold and mildew. As these fungi digest the materials they live on, they release noxious waste gases. The gases circulate through the air and are absorbed into soft items such as carpet, curtains, and furniture. Over time, they can also permeate harder surfaces such as walls and wood flooring. Different species of mold emit different odors. The particular musty odor you notice in your home probably won’t smell like the mold you find on bread, but it’s still a sign that mold is present. If you find three or fewer patches of mold less than 10 square feet each, you can safely clean them yourself, provided you’re not allergic to mold. Before you start, put on gloves, safety goggles, and a dust mask. If you find dry mold, remove as much as possible using a vacuum fitted with a HEPA filter. Remaining dry or wet mold can then be scrubbed off. To remove mold from a painted wall, mix up a cleaning solution by adding 1/4 cup white vinegar and 2 tablespoons borax to 2 cups of hot water. Spray the mixture onto the moldy surface, then scrub and wipe it clean. Spray a second time and let the solution soak in for 15 minutes. Scrub and wipe clean, then dry thoroughly. For non-porous surfaces, such as tile or glass, you can use a solution of half a cup to one cup bleach in one gallon of water. Because chlorine bleach doesn’t penetrate porous surfaces effectively, opt for oxygen chlorine bleach if you want to use bleach on such a surface. Avoid using bleach on furniture or carpeting because discoloration is likely. Alternatively, pick up one of the commercial mold removers available at home improvement stores and apply the product as directed. To remove minor mold growth from wood flooring and other wood surfaces, scrub the item gently with a wood cleaner designed to kill mold or with a mild detergent. If the mold doesn’t come off, you’ll most likely have to sand it off and refinish the wood surface. Do this using a dust-free sander that will vacuum up debris as you work to avoid spreading mold spores. Extensive mold contamination poses a potential threat to your health and suggests there could be serious mold damage somewhere you can’t see. 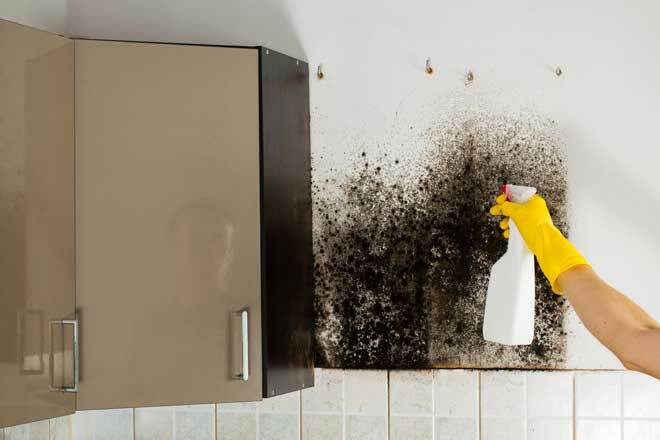 For this reason, if you find more than just a few patches of mold, contact a mold remediation specialist who’s either licensed by your state or who holds mold remediation certification. Keep in mind that mold can develop inside your walls, under your floorboards, and even inside your air ducts. You won’t see this mold, but you will smell it. 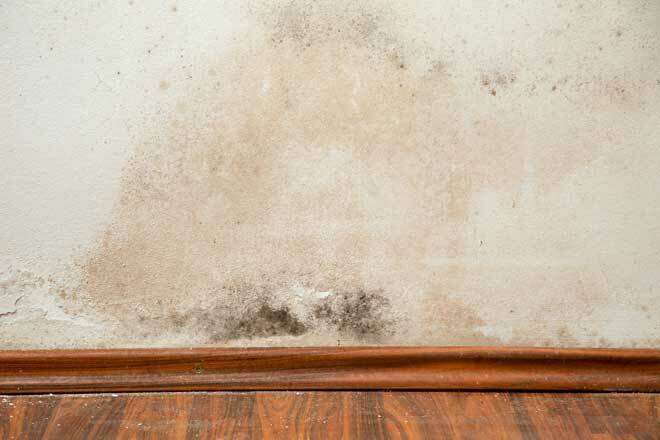 If your home has ever had a water leak and you can’t seem to get rid of the musty smell, there’s a good chance mold is still growing somewhere. In this case, call in a professional. Killing the mold and mildew is only the first step in getting rid of the musty smell. To remove lingering odors, you’ll need to clean the items that still carry those odors as well as freshen your air. If your clothes, curtains or other washable fabrics have picked up a musty smell, you may be able to get it out in the laundry. 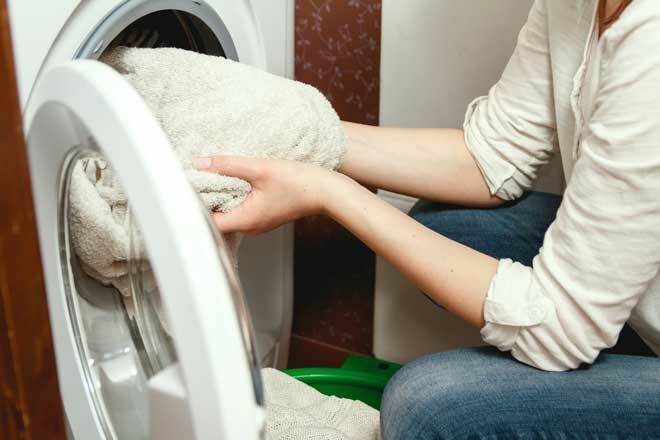 Load your washing machine as normal, add 1 cup of white vinegar and let it soak for 30 minutes. Then run the washing machine as usual, adding a scented liquid fabric softener during the rinse. Alternatively, use baking soda instead of white vinegar. When possible, hang the items out in the sunshine to dry. Exposure to the sun’s UV rays kills any lingering mold, while the fresh air helps blow lingering odors away. To draw musty odors out of soft furniture, use activated carbon, which you can find at aquarium supply stores in mesh bags. Place several of these bags inside the smelly furniture and leave them for several days to absorb the odors. If you can’t find activated charcoal, used coffee grounds is a good substitute. If this doesn’t eliminate the odor, commercial furniture cleaners are available to kill any remaining mildew without damaging the furniture. Leaving the furniture out in the sunshine for a few hours can also help. Your refrigerator can also take on a musty odor if old food was left inside or if it was left unused for a long period. To remove this odor, start by completely emptying the refrigerator. Add a tablespoon of baking soda to a quart of water and apply this solution to the entire interior. Fill the refrigerator with crumpled newspaper to absorb odor and moisture, and then leave the door shut for 24 hours. When you’re done cleaning, get rid of any musty odor lingering in the air. Lemon, which neutralizes odors, works well for this. Place several lemon slices, a few sprigs of rosemary, a teaspoon of vanilla, and two cups of water in a pan and let the mixture simmer on the stove. Baking soda can also help by absorbing lingering odors. Pour some baking soda onto several small plates, place the plates in areas where you’ve noticed musty smells, and leave them for a day or two. This works especially well in small spaces such as closets. To permanently get rid of the musty smell, take steps to correct the conditions that allowed the mold and mildew to develop. That means improving your ventilation and getting your indoor humidity levels under control. After cooking or showering, let the kitchen or bathroom exhaust fan run for around 10 minutes. Repair leaky faucets and pipes, which add moisture to the air. Make sure your appliances, such as your clothes dryer, vent to the outdoors and not into the attic or another indoor space. Keep your gutters and downspouts clean and in good repair so they don’t lead water onto your roof or walls. If you still find signs of high humidity or insufficient airflow, you might benefit from a dehumidifier or additional ventilation. Talk with a ventilation professional about installing this equipment. Musty smells can be stubborn and getting rid of them takes thorough cleaning, but with the right approach it’s possible to get your home smelling fresh again.